I got the email yesterday. It said, "I'm holding advance copies of your book in my hand, it looks beautiful. Which address should I send them to?" I was excited but a little numb I guess. Or maybe nothing can really prepare a person for the feeling of opening a package and pulling out a HARDCOVER book with your name on the cover. I think that's it. So there I was trying to concentrate on work all morning, with an undercurrent in my brain saying, "it's coming," quietly, insistently, constantly. The second I went upstairs to do something, I heard the dog bark. Here it was. I ran to the door and stood in front of it, waiting for the Fedex guy to ring the bell. I guess I didn't want to appear too eager. I opened the door, shoved the dog inside, signed the electronic thingy shakily and then grabbed the package with a feeling in my stomach like being in love. I ripped it open and just kept saying "oh my god", "oh my god", "oh my god." The dog looked worried. She shouldn't have been. There it was, real, concrete, and gorgeous beyond belief. The design of the cover is raised and embossed and it has a super cool blurb on the back by Novella Carpenter. I am feeling very lucky right now and also so thankful for the opportunities I've had. In the end, the dog wasn't really that excited. These are the times you wish you worked in an office, where if you shout, people will hear. I guess, that's what Twitter and Facebook are for. Stay tuned soon for a gorgeous new WordPress site to do justice to this book! This entry was posted in Books, DIY, food news. Bookmark the permalink. Post a comment or leave a trackback: Trackback URL. OMG is right. I am cheering from 1/4 mile away…can you hear me? I only know a published writer and I AM EXCITED. Congrats vb all the way from new zealand! so exciting to see your book in print!!! CONGRATULATIONS! Wonderful news and such a pretty book – great work!!! We couldn’t be happier for you! xo rock & co. Thanks everyone! and Rocky, you know I wouldn’t have done it without you! And Sara, all the way from New Zealand. Thanks! OMG is right. I read about your visit at Omnivore and we plan to be there! OMG – hope to experience that feeling one day! 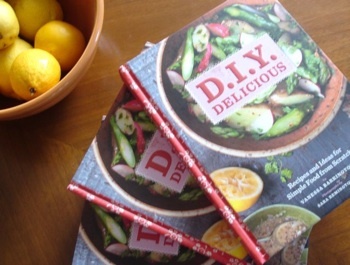 Just now am writing the line “how about DIY granola in less time than it takes to drive or walk to the store to buy some” – including this wonderful book in a post. Hope to maybe see you at the Seafood Summit in Vancouver or if not, hope paths will cross soon. Congratulations! thanks for posting Jackie. Glad you like the book! I’m not at the Seafood Summit, sadly. Hi! Came from an article on food-swapping in the NY Times. Congrats! The book looks awesome! Great! Thanks for stopping by! All the way from Malaysia! I love experimenting with Malaysian food. I use James Oseland’s book, Cradle of Flavor. http://www.amazon.com/Cradle-Flavor-Indonesia-Singapore-Malaysia/dp/0393054772. Such wonderful flavors. Hi Lindsay, Thanks for stopping by to say hi. Best of luck with your garden and cooking adventures. I just planted tomatoes, (hoping to can sauce this year) peas, scarlet runner beans, and lettuces. Planning a bit more in my little patch here in Oakland. I hope you’ll share your adventures here. Yay! I just bought this book yesterday, and that’s what brought me to your page. I think I’ve already read each title and ingredients, and read most of every single word on every single page. Simply put, I love it. And I’m so excited to try some new stuff! Jess, thanks for stopping by. I just took a look at your beautiful blog. Best of luck with your kitchen endeavors and enjoy your new home! You can always email or leave a comment if you have questions about anything in the book. There are two errors I’ll tell you about now, to make sure you have success. The mascarpone recipe should say tartaric acid instead of cream of tarter (copyediting error) and the liquid was inadvertently left out of the chile sauce recipe. You should save the chile-soaking water and add it in while blending the chiles to the desired consistency. You can also use vegetable or chicken broth, if you prefer. I purchased your book of all places… at the Mayo Clinic store at the Mall of America. As I was paging through it I knew that this was the book for me! I admit that I have quite a collection of cookbooks, but this one is one that I’ll keep forever. I’ve made a few of your recipes, and have wowed friends with homemade ginger beer, yogurt and creme fricaise and tonight I’ll be whipping that into real cultured butter! I feel so French! We do need to get back to basics, and making things yourself isn’t very difficult at all. Can’t wait to try all of your recipes. For anyone skeptical… you really must taste fresh yogurt, it’s sweet and only slightly tart, and very different from that which you buy in the store. Kids tend to love it. It’s easy once you get the hang of it, plus, summer is an excellent time to make yogurt and ferment anything. thanks for stopping by. Impressive that you’ve tried so many recipes already! Yay. The butter is soooo good. Appreciate your comments. Happy cooking!